A broken ankle is a break in one or both of the bones that make up the ankle joint. These bones are the tibia and the fibula. Ankle breaks, or fractures, can occur in many ways: for example, by falls, contact sports and exercise injuries, and force from a blow. Comminuted fracture: there are more than two pieces of bone at the fracture. Compound (open) fracture: one end of the broken bone has broken through the skin. Closed fracture: neither end of the broken bone has pierced the skin. Impacted fracture: the ends of the broken bone are driven into each other. Avulsion fracture: the muscle or ligament has pulled a portion of the bone away from where it was originally attached. Pathological fracture: the bone has been weakened or destroyed by disease (such as osteoporosis) so that the bone breaks easily. Discolored skin, or bruising, which appears hours to days after the injury. Rarely, you may have an open wound with an ankle fracture. views of the bone may be taken to pinpoint the fracture. cast or boot after a short period. If the ankle bone cannot be aligned perfectly before it is ready for a cast, surgery will be necessary in some cases. In the first 2 to 3 weeks after the injury, be sure to keep your ankle elevated on pillows and place ice packs on top of the cast for 20 to 30 minutes every 3 to 4 hours to help reduce swelling. Make sure the cast does not get wet. Cover the cast with plastic when you bathe. Use crutches or a cane, as directed by your health care provider. He or she will tell you how much weight you can put on your leg, if any. Not scratch the skin around the cast or poke things down the cast. Eat a variety of nutritious foods. Elevate the leg when possible to reduce any swelling. You have swelling above or below the fracture. Your toenails or feet turn grey or blue and stay grey or blue even when your leg is elevated. You have numbness or complete loss of feeling in the skin below the fracture. You have lingering pain at the site of the fracture under the cast, or increasing pain not helped by elevation or pain medication. You have burning pain under the cast. The goal of rehabilitation is to return you to your sport or activity as soon as is safely possible. If you return too soon you may worsen your injury, which could lead to permanent damage. Everyone recovers from injury at a different rate. Return to your sport or activity will be determined by how soon your ankle recovers, not by how many days or weeks it has been since your injury occurred. Some people return within a few days after the cast is removed, some in several weeks. Your ankle will be healing while you are doing your rehabilitation exercises. These exercises will help improve your ankle strength and range of motion. You can do 20-yard figures-of- eight, first at half-speed, then at full-speed. You can do 10-yard figures-of- eight, first at half-speed, then at full-speed. Wear proper shoes that fit correctly when you exercise. Gently stretch before and after physical activities such as aerobics, running, and sports. Avoid playing recreational sports when you are fatigued. Developed by McKesson Health Solutions LLC. As soon as you can tolerate pressure on the ball of your foot, begin stretching your ankle using the towel stretch. 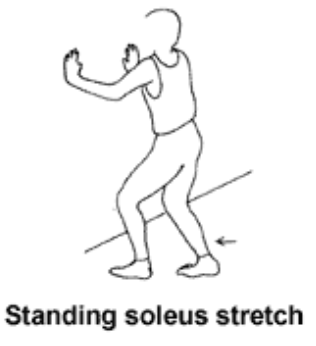 When this stretch is too easy, try the standing calf stretch and soleus stretch. • Towel stretch: Sit on a hard surface with your injured leg stretched out in front of you. Loop a towel around the ball of your foot and pull the towel toward your body keeping your knee straight. Hold this position for 15 to 30 seconds then relax. Repeat 3 times. slowly lean into the wall until you feel a stretch in the back of your calf. Hold for 15 to 30 seconds. Repeat 3 times. Do this exercise several times each day. inward and keep your heel down on the floor. Hold this for 15 to 30 seconds. Return to the starting position. Repeat 3 times. You can do the next 5 exercises when your ankle swelling has stopped increasing. • Ankle range of motion: Sitting or lying down with your legs straight and your knee toward the ceiling, move your ankle up and down, in and out, and in circles. Only move your ankle. Don't move your leg. Repeat 10 times in each direction. Push hard in all directions. shut the knot in the door. Move backward until there is tension in the tubing. Keeping your knee straight, pull your foot toward your body, stretching the tubing. Slowly return to the starting position. Do 3 sets of 10. • Resisted plantar flexion: Sit with your leg outstretched and loop the middle section of the tubing around the ball of your foot. Hold the ends of the tubing in both hands. Gently press the ball of your foot down and point your toes, stretching the tubing. Return to the starting position. Do 3 sets of 10. 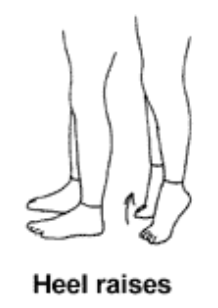 • Resisted inversion: Sit with your legs out straight and cross your uninjured leg over your injured ankle. Wrap the tubing around the ball of your injured foot and then loop it around your uninjured foot so that the tubing is anchored there at one end. Hold the other end of the tubing in your hand. Turn your injured foot inward and upward. This will stretch the tubing. Return to the starting position. Do 3 sets of 10. • Resisted eversion: Sit with both legs stretched out in front of you, with your feet about a shoulder's width apart. Tie a loop in one end of the tubing. Put your injured foot through the loop so that the tubing goes around the arch of that foot and wraps around the outside of the uninjured foot. Hold onto the other end of the tubing with your hand to provide tension. Turn your injured foot up and out. Make sure you keep your uninjured foot still so that it will allow the tubing to stretch as you move your injured foot. Return to the starting position. Do 3 sets of 10. You may do the rest of the exercises when you can stand on your injured ankle without pain. leg to the floor slowly. Do 3 sets of 10. Written by Tammy White, M.S., P.T., for McKesson Health Solutions LLC.